(n) Abbreviation for a jack, usually found only in written text about cards. J♥, for example, is the jack of hearts. (n) 1. 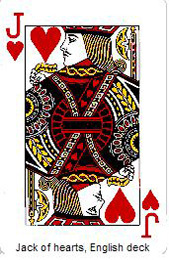 A face card, the one that ranks between the 10 and the queen, of which a standard deck contains four, one each in the spades (♠), hearts (♥), diamonds (♦), and clubs (♣) suit. — (v) 2. Raise. “I’ll jack it” means “I’ll raise.” “I’ll jack the pot.” Often part of the phrase jack it, jack up, or jack it up. (n phrase) In hold’em, a 3 and a 9 as starting cards, from Benny’s running gag about his age. (n phrase) In hold’em, J-7 as starting cards. Comes from Jack Daniel’s Old No. 7 Tennessee whiskey. (n phrase) 1. 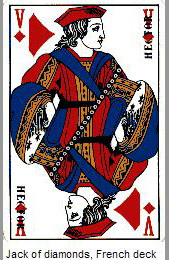 In high poker, a no pair hand whose highest card is a jack. “I have jack high; can you beat that?” (Also, “I have a jack high; can you beat that?” The difference is that word “a.”) “Yeah, I got queen high.” 2. In low poker, a hand topped by a jack. (v phrase) 1. Raise. 2. Jack up. (n phrase) Jack (the card). (n) A face card. In the English deck, the figure faces forward, tilted to the right. He holds in his left hand an unrecognizable object that was originally an arrow. A feather sticks out of his hat. In the French deck, the figure faces forward, tilted very slightly to the left and holds in his left hand something that looks like a shield attached to a string. The index is V, for valet, the French word for jack. Known in the French deck as Lancelot. Also known as Ogier. (n) A face card. In the English deck, the figure faces forward, tilted to the left. He holds in his left hand a sword. 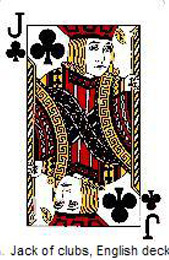 In the French deck, the figure appears in profile, facing to the right. The index is V, for valet, the French word for jack. Known in the French deck as Hector. (n) A face card. In the English deck, the figure appears in profile, facing to the left, and holding an axe behind his head. He has a mustache. One of the one-eyed jacks. In the French deck, the figure faces forward, tilted very slightly to the left. The index is V, for valet, the French word for jack. Known in the French deck as La Hire. (n) A face card. In the English deck, the figure appears in profile, facing to the right. He holds in his left hand an unrecognizable object that was originally a spear. He has a mustache. One of the one-eyed jacks. In the French deck, the figure faces forward, tilted very slightly to the right, and has a feather in his hat. The index is V, for valet, the French word for jack. Known in the French deck as Hogier. (n) 1. A progressive prize in some cardrooms given to the player who gets a specific very good hand beat. In hold’em, this is usually aces full or higher, plus there usually is a stipulation that both hole cards must play. 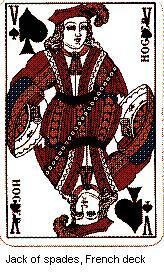 (That is, a jackpot is not awarded if either hand involved uses only one of its hole cards to form the best hand.) Thus, for example, if the board were A♠ A♥ K♠ K♥ J♥, and Emilie had A♦ 9♦, while John had K♦ K♣, Emilie would not be eligible for the jackpot, even though her aces full got beat, because her 9♦ did not play. In ace-to-five lowball, usually a 6-4 must be beat. In other high games, it’s some given hand, perhaps aces full, or four of a kind. The procedure for collection of the prize fund differs in each cardroom. In some, part of the antes or blinds, called the jackpot drop, is taken each hand and added to the jackpot fund. The procedure for awarding the jackpot also varies widely. In some clubs, the fund is for all games; in others, it is for a specific game. That is, for example, the 2-4 hold’em (all tables at that limit) may have one jackpot, while the 3-6 and 5-10 each has its own separate jackpot. The usual procedure is the holder of the beaten hand receives the largest share of the jackpot; the holder of the hand that beats the loser receives a smaller percentage; while the remainder of the players split a third portion. The division might be 50 percent of the jackpot to the loser, 25 percent to the holder of the winning hand, and 25 percent split among the other players at the table. In some large clubs, the jackpots frequently grow into the tens of thousands of dollars, leading to the interesting phenomenon of players specifically trying to get their hands beat, and often staying in for several bets on hands they might not otherwise play. Also called bad beat jackpot. Also see double jackpot, triple jackpot. 2. The top prize or prizes on a video poker machine, usually paid for getting a royal flush or four of a kind, sometimes progressive. 3. The top prize or prizes in various house-banked casino games, sometimes progressive. (n phrase) Poker with jackpots. See jackpot. (n) A form of high draw poker, in which a player cannot open the pot without holding at least two jacks as openers (definition 1) before the draw. This is the same as jacks or better; the term jackpots is mostly used in home games. In some home games, there may be a progression of openers. That is, if no one opens on a jackpots hand, the cards are shuffled and redealt and the next hand is played with queens as openers (queenpots), followed by kingpots and acepots. The players may ante each new deal and the progression usually stops (and remains until opened) at acepots. After the acepots hand is opened and played, the game usually reverts to jackpots. See progressive jackpots. (n phrase) A form of five-card draw poker in which each player in turn looks at his cards, and opens if he has jacks or better (and if he wishes). If no player opens for high — and to do so he must have at least a pair of jacks (and he must show openers at some point) — then the hand is played for low (as described under ace-to-five), again starting with the player to the left of the dealer. At this point, the game becomes bet-or-fold. (n phrase) A full house consisting of three jacks and a pair. (n phrase) High draw poker in which the opener must have at least a pair of jacks to open, and be prepared to show openers before the pot is out of play; if no one opens, players ante again, sometimes the limit increases, and the next dealer deals. Also sometimes called jackpots, a term mostly used in home games. Compare with straight draw. (n phrase) 1. Jacks up. 2. Jacks full. (n phrase) Same as jacks or better. (n) A high draw game, usually found only in private or home games, played jacks or better required to open and three of a kind to win. If no one qualifies after the draw, the money in the pot remains for the next hand in which someone does qualify, with the same two sets of qualifications needed in each pot. Usually the players add a new ante each deal. (n phrase) Two pair, the higher of which are jacks. (v phrase) 1. Raise the limits. “Let’s jack up this game!” means let’s play for higher stakes. 2. Raise. “Let’s jack up this pot!” means “I raise.” For both meanings, also jack it up. (v) 1. Make the hand you’re drawing to. In hold’em or draw, you might say, “I jammed the straight flush.” In lowball, if you jam a hand, you catch inside. 2. Raise; sometimes raise all one’s chips in a no-limit game. Often part of the phrase ram and jam. 3. Bet all one’s chips in a no-limit game. (v phrase) Jam (definition 2). (adj phrase) 1. A pot that has been capped, that is, raised the maximum number of times permitted. 2. A pot with lots of betting, raising, and reraising. (n phrase) Jammed pot (definition 1). (v phrase) Jam (definition 1). (v phrase) Jam (definition 2 or 3). (v phrase) 1. Jam (definition 1). — (adv phrase) 2. Specifically as drawn to, with reference to a drawing hand. “I made the six jam up” means that a player, in ace-to-five lowball, was drawing to a 6-high hand and caught the perfect card. If, for example, his cards before the draw were 6-5-3-A, he caught either a 2 or a 4, and, probably, specifically a 2. (n) The nuts. “Get in a pot with him and he’ll show you Jerusalem.” More commonly called the Holy City. (n) Jesse James (definition 1). If you raise me out of a pot, I might say, “Take it, Jesse.” This implies that you have bluffed me out with your bet. (n phrase) 1. A pot stealer; a bluffer. 2. In hold’em, a 4 and a 5 as the starting cards, because legend has it the famous outlaw was shot with a .45. (n) $5 or a $5 chip. Comes from the five cents that used to be the fare on a jitney bus. (v phrase) In hold’ em, 6-9 as starting cards. Named after a famous gambler and high roller of the ’20s and ’30s. Why those specific cards is unknown. (v phrase) A cut made to a brief by a cheater, such that a desired clump of cards ends up at a specified location of the deck, usually right at the top or at the bottom. (n) 1. Jack (the card). 2. Easy prey for a thief; ignorant or naive player. From the slang term for a prostitute’s customer. (n phrase) In hold’em, J-J as starting cards. Comes from the renowned professional poker player’s initials. (n) Cardroom; gambling establishment. Also called store or shop. Sometimes part of the phrase bust-out joint, carpet joint, juice joint, sawdust joint. (n) 1. The 53rd card in a deck, generally used only in draw games, where it is often designated as the bug. Also man with the star, nose picker, etc. 2. In home games, the joker is often completely wild, that is, it can represent any card. Thus, in addition to making an extra ace or filling any straight or flush, it also can make a pair with any single card, three of a kind with any pair, a full house with any two pair, four of a kind with any triplets, or five of a kind (a hand that ranks higher than any straight flush) with any four of a kind. Sometimes two jokers are used in home games, producing a 54-card deck. (n phrase) Any poker game in which a joker is used. Also called poker with the joker. (n phrase) Joker wild. Why this is plural is not clear; perhaps an apostrophe is missing. Also, joker’s wild. (n phrase) Joker wild. Might stand for “joker is wild” or might simply be an illiterate rendering. (n phrase) Any poker game in which a joker is used as a wild card that can stand for any card, not just as another ace or in straights, and flushes (in which case it is called the bug). Also called jokers wild, poker with the joker. (n phrase) Three 10s, probably referring to 30 days, one of the many sentences the famed frontier judge was famous for handing out. (n phrase) Three 10s, probably referring to “30 days or $30,” a common sentence handed down for pleading guilty in the 1930s and ’40s to illegal gambling, by this (probably) generic judge. (n) The queen of hearts. May come from the Biblical Judith, who helped save the Jews from Assyrian rule by beheading their leader, Holofernes, an invading general of Nebuchadnezzar. May also come from Judith, Duchess of Bavaria, who lived in the 10th century. (n) 1. Markings on cards (put there by a thief). 2. A percentage of each pot kept by the house; also called rake or vigorish. 3. Influence, particularly in a casino. “John has a lot of juice. He gets comped [see comp] at every casino in Vegas.” Also called pull. — (v) 4. To mark a deck. (n phrase) A crooked cardroom or gambling establishment, particularly one with marked cards (juice). Also called wire joint. (v phrase) Come in cold. Also, hop the fence.